Here's one of those registry keys I can never remember when I need it every couple of months or so. You've logged into the client's server or you're on their network directly but want to take over a PC to fix some pesky Outlook problem. So you've got access to Manage their Computer or load their registry with Regedit. If you want screenshots of the details take a look at the omniscient Daniel Petri's website here. Got a Small Business Server 2003 R2 box that started throwing a whole load of errors about Update Services failing and Monitoring not working, neither was the standard MS NTBackup. Updates Services 3.0 SP2 required an uninstall, then an uninstall of 2003R2 technologies. Followed by a reinstall of both. Monitoring was straightforward. I ran the configure wizard and told it to reinstall back to default. Googling gave several different suggestions, including reinstall the Admin tools, a hotfix to recreate the MS Integration part of the registry and resetting WMI. None of which fixed the problem. I did notice that the summary configuration page quoted the backup destination as \Backup Files without the drive letter (external USB). 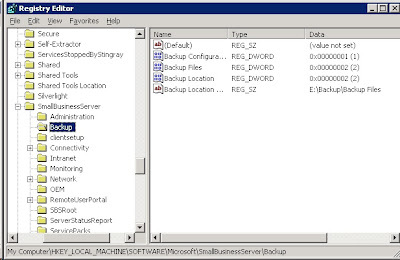 Poking around in the registry uncovered this in HKLM\Software\Microsoft\SmallBusinessServer\Backup but it already included the drive letter. Editing the subkey didn't help.